Recently I’ve had a lot of client and readers ask questions about inflammation and what are the most anti-inflammatory foods they should be consuming, as well as those foods to avoid. Trying to keep it in the most simple terms as possible, below is the main difference between acute and chronic inflammation. I have also included a list of foods to totally avoid, as well as those you should be consuming daily. It’s so important to include foods these foods that promote the anti-inflammation to avoid illness, fatigue, chronic pain and more. Acute inflammation is a natural defense mechanism that is initiated when body tissue is damaged. 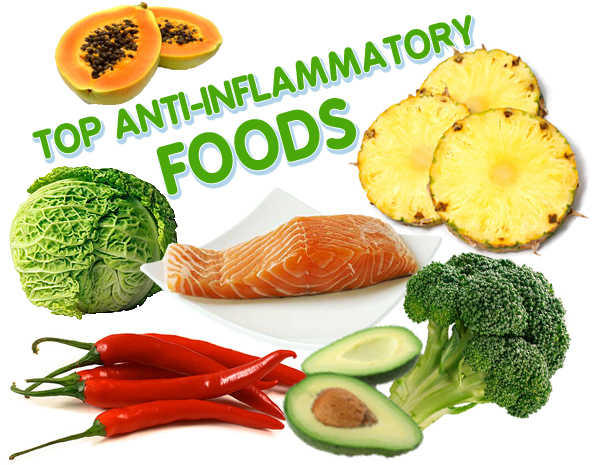 Typically, inflammation is a healthy immune response to injury, illness, or infection. “Healthy” inflammation carries isolates, identifies and removes bad bacteria and cells. The inflammatory response prevents the spread of damaging agents to nearby tissues, disposes of cell debris, and sets the stage for the repair process. It is crucial for our bodies in recovery and healing to experience acute inflammation to encourage recovery, as well as to protect surrounding healthy cells and tissue. The redness, swelling, and pain are all signs of healthy inflammation when our bodies are recovering. After the healing process has come to an end, the inflammation response should too. However, in many cases inflammation continues, whether it was brought on from trauma or was present before any healing process has even begun. Chronic inflammation is when our body is unable to turn off the inflammatory response and starts to attack the surrounding healthy tissue. It can manifest in your gut, destroying stomach lining and causing digestive issues, may attack arteries causing heart disease, or in your joints, resulting in arthritis. Many of us experience chronic inflammation, whether we are aware of it or not. Chronic inflammation in our system is caused from poor diet, high stress, and an imbalance of Omega 6 to Omega 3 ratio. Chronic inflammation is the number one factor for numerous health issues and is the culprit for most illness and disease such as cancer, joint disease, autoimmune disease, and heart disease. As you can see, it is crucial to keep inflammation under control. Be sure to eat an anti-inflammatory diet, get adequate rest, and aim to reduce stress in all areas of your life. It is also a good idea to eliminate pro-inflammatory foods such as sugar, refined grains, alcohol, processed foods, among others. Also, lifestyle suggestions that will help reduce inflammation and boost the immune system are meditation, yoga, exercise, any stress reducing activities, acupuncture, and massage.